(This product is for Pathfinder). In Mystical, you can play as a Monster Trainer or one of 6 archetypes for that class. Utilizing your unique talents, you and your party will travel through a realm known only as The Kingdom in search of monsters to capture and raise. Along the way, you'll find upwards of 154 monsters; some new and some Pathfinder favorites. By capturing monsters, you gain access to new spells that you can use to either battle other trainers in the arenas that exist throughout the Kingdom or combat evils in your own or another campaign world. As you master the spells those monsters grant you, you can capture even stronger monsters and learn different spells on your journey to become one of the greatest trainers there is. In addition, there are several new feats for the dedicated Monster Trainer as well as those that will help you to incorporate a little bit of monster training into other classes such as the Druid, the Summoner, or even the Wizard. Any class that gains a companion in some form or another can learn something from monster training. New spells and magic items accompany would-be trainers on their quests, and a brief description of several locations throughout the Kingdom (including where to capture certain monsters) can be found as well! That's everybody. Thank you all for your support. I have sent out all of the complimentary copies for review. As soon as I get those back, I will publish the update publicly. I'm open to offering some feedback, and I'm a touch familiar with design work so hopefully I'd offer something useful! I'm excited for you're new update! I wouldn't mind giving the new edition a look-over, though I'm not sure what I can contribute. I'd be interested in reading and providing feedback on the Player's Advantage book. Hi! I have readed the manual and liked it a lot, im a DM with pathfinder and a bookworm of roleplaysystems, and know a very wide kind of them. Also i have the tame to take a look at the updated version to help you to get the very best for the fans of pahfinder. I will be willing to provide feedback. Awesome, thank you. From the looks of it, I will need your email to provide the link for the updated download. 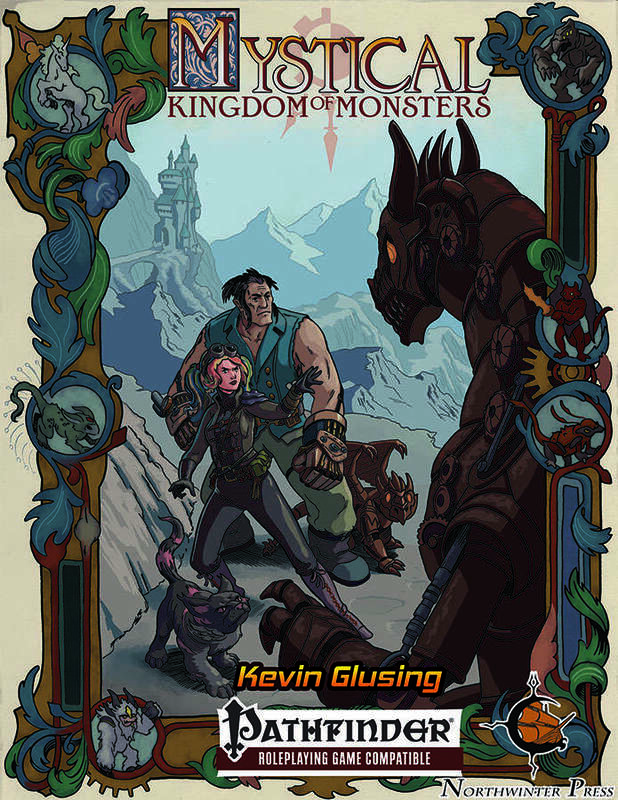 Could you please either PM our Facebook page (Mystical: Kingdom of Monsters) or email me at kglusing@gmail.com so I can get that to you? I'm also interested on the update/ additions book, and would be glad to offer my assistance! Interested in looking at the updates/additions. I'd be happy to read over/edit the book and provide feedback. Some major additions are on the way this year with Player's Advantage: Monster Trainer coming in December. In anticipation of the new book, I have gone back to John Reyst's d20pfsrd and cleaned up the monster trainer class page, which was a little disheveled after the website moved. Now, it's cleaner, prettier, and I've even added some minor updates that will be included as a sidebar in PA: MT to help monster trainers better understand how to capture and train their monsters. I'm really happy with how this update is turning out, but If you've followed us for a while and have played or are playing a monster trainer, take a look at this cleaned up text on the website and let me know what you think here or on our Facebook page. Grab this quickly before the owners of Pokemon shut down this infringement of their IP. Don't be silly; there is no copyright or IP infringement going on with this product.